The production of culture was once the domain of artists, but beginning in the early 1900s, the emerging fields of public relations, advertising, and marketing transformed the way the powerful communicate with the rest of us. A century later, the tools are more sophisticated than ever, the onslaught more relentless. NATO THOMPSON is Artistic Director at Creative Time, one of New York’s most prestigious and exciting art organizations. He is the editor of Experimental Geography: Radical Approaches to Landscape, Cartography, and Urbanism (Melville House), The Interventionists: A Users’ Manual for the Creative Disruption of Everyday Life, and Living as Form: Socially Engaged Art from 1991–2011. His most recent book is Seeing Power: Art and Activism in the 21st Century (Melville House). “Yes, art ‘works,’ as the saying goes, but what work does it do? Does it make us wiser? Does it help us to understand ourselves? Not necessarily. 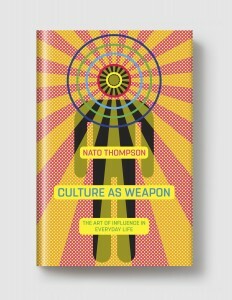 As Nato Thompson shows us in this wide-ranging and provocatively written book, art sometimes takes us down a different road entirely. Art sells; art gentrifies; art puts a nice glossy shine on the neoliberal project. Read it and discover exactly how mistaken is our assumption that human creativity brings us always closer to some earthly utopia.”—Thomas Frank, author of What’s The Matter With Kansas?